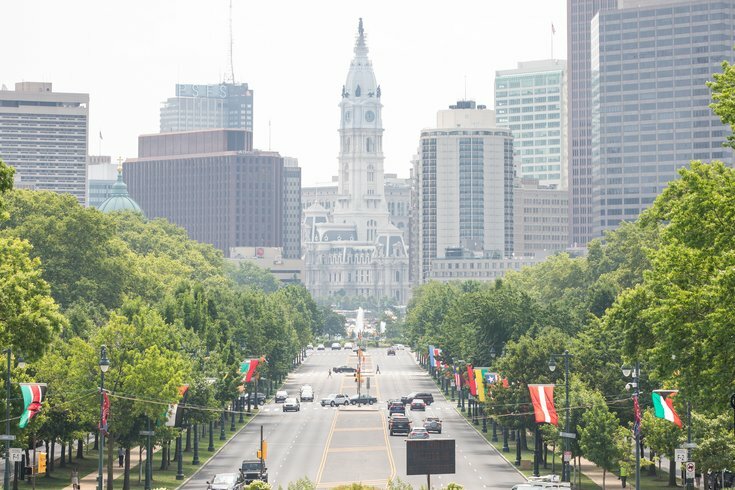 The Israeli flag hanging among hundreds of other nations' banners on the Benjamin Franklin Parkway was defaced Tuesday afternoon after an unidentified man, taken into police custody, was found allegedly shooting red paint at it. According to 6ABC, members of the Jewish Federation of Greater Philadelphia discovered the vandalism around 3:30 p.m. and reported it before going outside to confront the suspect, who was under the flag at 16th Street on the Parkway. Federation spokesperson Laura Frank said as they approached, a man holding a paint gun dropped the device and ran away. Police arrived soon after and the man returned to the scene. Police arrested him and asked if he was responsible for painting the flag, to which he responded yes. For the time being, police are not categorizing the act as a hate crime, but instead charging institutional vandalism. Because the act accrued less than $5,000 of property damage, it will likely be labeled a second-degree misdemeanor, rather than a felony. “I’m very upset to learn of the desecration of the Israeli flag that hangs along the Benjamin Franklin Parkway. Hate and anti-Semitism have no place in the City of Philadelphia,” said Mayor Jim Kenney in a statement. The incident occurred just one day after tensions peaked in the Gaza Strip following the move of the U.S. Embassy to Jerusalem from Tel Aviv and thus officially recognizing Jerusalem as Israel’s capital. A reported 60 Palestinians were killed by Israeli forces near the Gaza-Israel border during demonstrations against the embassy, sparking protests in Center City on Monday afternoon. The Israel flag was replaced later Tuesday night. The area near the flag is currently fenced off as construction continues for a Holocaust Memorial Plaza, slated to open this fall.